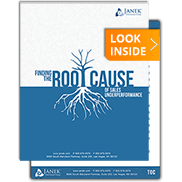 Chances are that if you are interested in this white paper, you are a business or sales leader trying to resolve a performance issue. Maybe your quarter is looking soft, maybe you're about to miss your number, or maybe you just missed and you need to turn things around. You’re in a tough spot. We’ve walked in your shoes, and we too have felt the pinch. We’ve also helped dozens of clients in similar situations, and we can assure you that it is possible to rebound. To help you get started down the road to a brighter future, we are providing you with this step-by-step guide. It contains information and tools to help diagnose your problems and take immediate, definitive action to improve.